Job interviews never used to be a standard procedure in my line of work. Traditionally, you’re asked to do a few shifts, and if they like you, then you get to do a few more, and somewhere down the line you may be offered a contract. It’s a bit like a massively extended version of the Apprentice, except it’s not as entertaining and you get paid during the process. And, obviously, you don’t need to be a game-changing, thinking-outside-the-box, nonsense-spouting berk to take part. So having an interview for my present job, which I started five months ago, put me in an unfamiliar arena, which is my excuse for being momentarily flummoxed when I was asked at the end if I had any questions. Of course I did; I was just so relieved to have reached the end that my mind went blank for a second and I just couldn’t remember them. So instead of enquiring about healthcare or the pension scheme, I asked about an aspect of the job which only a foolish bicycleperson would ask: what are your bike parking facilities like? I wasn’t quite prepared for the answer. Apparently many of the top people in the company are cyclists and one of the main things they wanted was a secure facility to store their bikes and change into their civvies. And that’s what they, and we, have got. 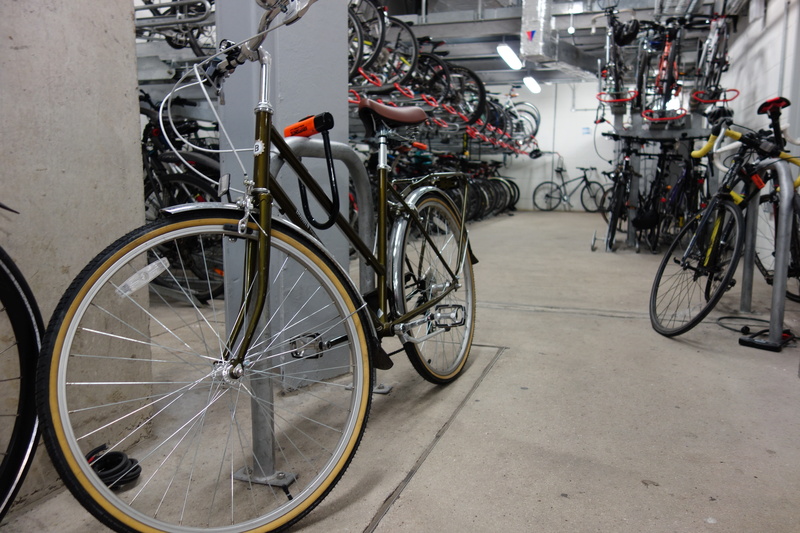 Whenever I have mentioned this in passing to one of my cycling chums, they react with a wide, beaming smile, a bit like a child being told, “Pack your bags – we’re off to Disneyland!” It seems that in the workplace a proper bike parking facility is the stuff of a madman’s dream. So I thought I’d give you, my several readers, the same vicarious pleasure by going into greater detail about these facilities and showing you what they look like. Our bike park is situated beneath the building and is monitored by CCTV cameras. To get in, you need to swipe your pass at two sets of doors at either end of a short corridor, the first of which has to have closed before you can open the second. This security system has already thwarted one enterprising ne’er-do-well who managed to tailgate someone going in but then found, after taking a load of clothes and actually changing into them, that she couldn’t get out. Most of the bikes are stored on split-level racks; to wheel your bike up onto the top part, you pull out the metal arm it will stand upon and, voila, you have a ramp. Thanks to this space-saving idea, there is ample parking for approximately 200 bicycles in a relatively compact area. There are toilets and small lockers around the parking bays, while upstairs has showers, male and female changing rooms and a drying out room for when Mother Nature blesses you with a thorough drenching. 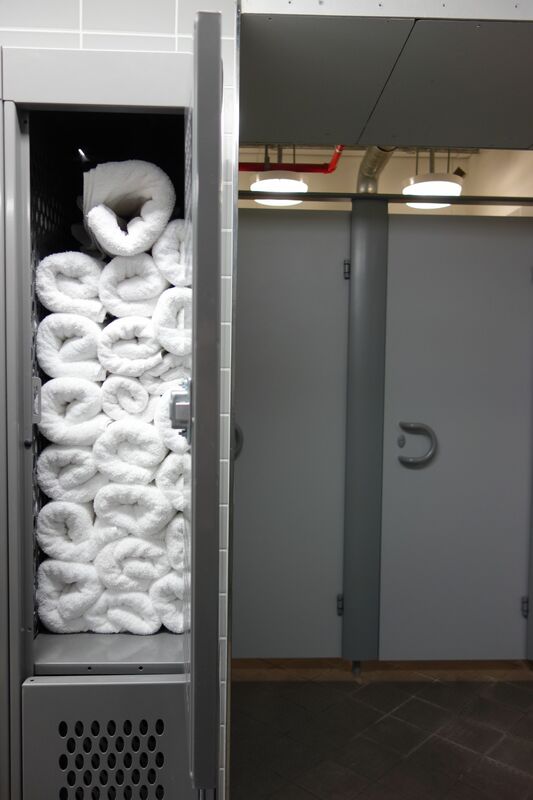 The changing room has free towels which are replenished twice a day as well as lockers which are bigger than those downstairs and lining the corridors. 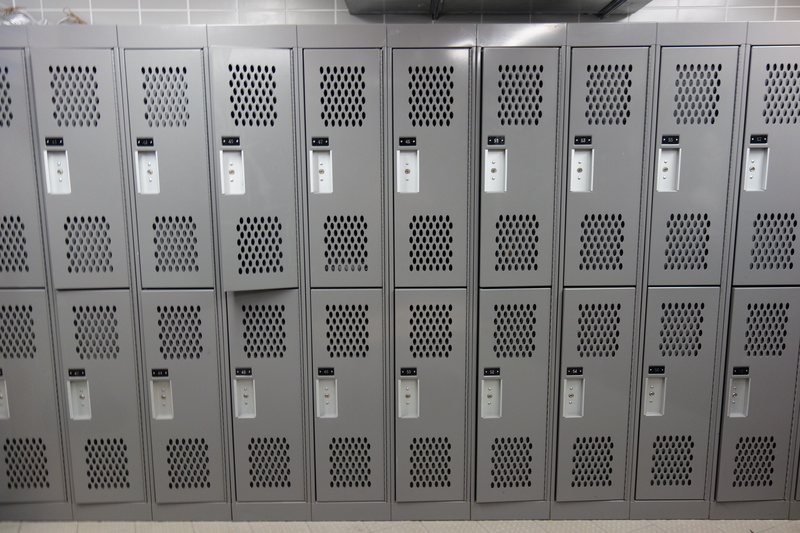 Naturally, many people with small lockers such as myself covet these big ’uns. I know I did – until the day I walked into the office and saw a fellow cyclist wearing a pair of ladies’ three-quarter-length jogging pants which he had to borrow from a female colleague. 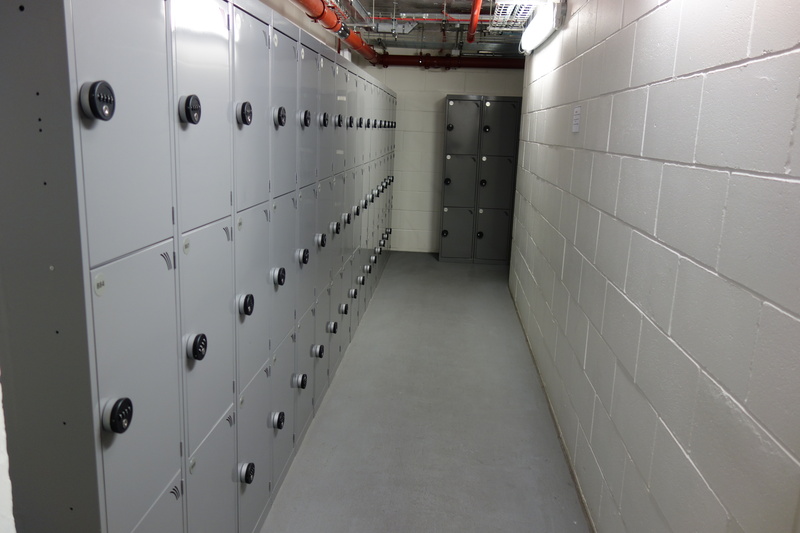 Unlike the small lockers, which have combination locks, the big lockers need a key – which, unfortunately, he had forgotten. The changing room is quite small, so there seems to be a certain etiquette: don’t take up more space than you need and try to keep keep a towel wrapped around your waist as much as you can, because no one needs to see that sort of thing at close proximity, mate. The occasional bike chat with fellow cyclists is fairly standard – discussion of commuting routes, equipment, moaning about poor driving and so on – while joggers seem to exist in a world of their own, silently thumbing their smartphones or, in the case of one bloke, wandering in straight from a run, mixing a recovery drink in the shower and then walking straight out again. I’m sure he does shower and change before returning to his desk, I’ve just never seen him do it. The downsides? Well, there aren’t any. It’s a safe, secure, clean facility that’s a pleasure to use, although it’s a shame there’s a bit of low-level rule-breaking going on. 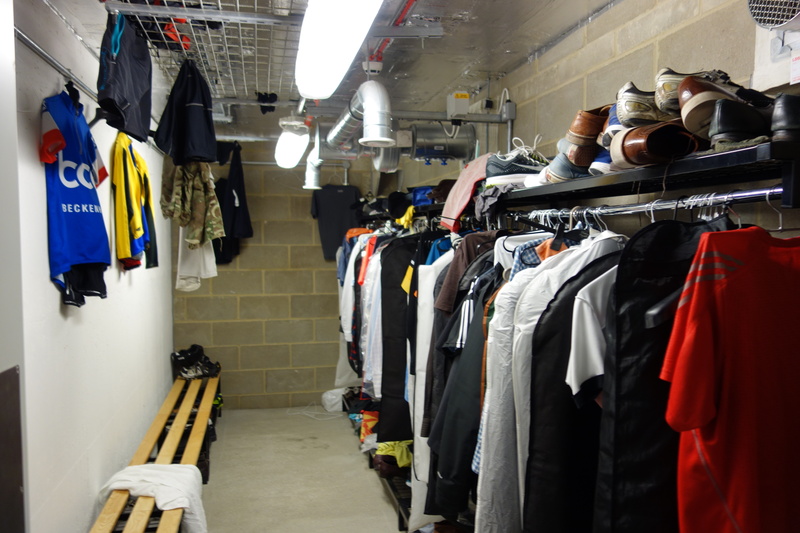 The drying out room, pictured above, looks like a walk-in wardrobe, even though there’s a sign asking us not to use it to store clothes, and a track pump which appeared to be for our shared use went missing a couple of months ago. (A handwritten note asking where it had gone prompted one wag to write beneath: “It stepped outside to get some air.”) A bigger problem is that dozens of bicycles have been locked to racks months ago and never used again, so as of this month, all bikes need to be registered and have a numbered disc attached to them. Any remaining bikes are going to be removed and stored in a nearby car park, and those which aren’t claimed will be shipped out to a charity in Africa. Quite right, too. There are many who would love to use this bike park – as the amazed faces of my friends can attest. This post is about a few things I see on my bicycle ride into town. No, no – wait! Come back! It won’t be that dull! Or at least I’ll do my best to make sure it isn’t. Firstly, I would like to introduce you to a prime candidate for Trades Descriptions: Invisible Menders of Knightsbridge. For a start, it’s in South Kensington, not Knightsbridge. And, as you may have noticed from the orange and brown frontage, the shop is not invisible. I mean, honestly – how could they have got away with this for so long? It’s a complete misnomer on every conceivable level. 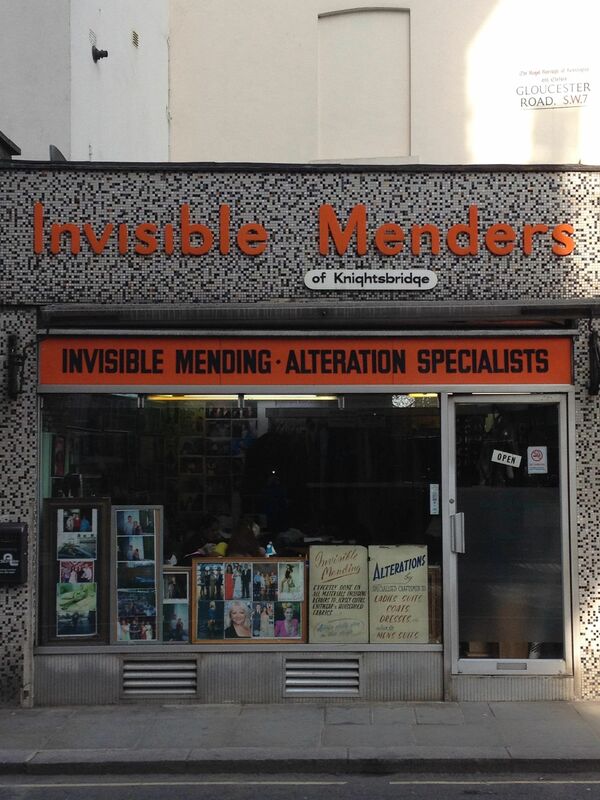 In another sense, though, Invisible Menders is invisible, because after stopping hundreds of times at the traffic lights on the junction of Old Brompton Street and Gloucester Road, I have yet to see anyone startled by the façade or the yellowing signs with their jaunty, cursive typeface. It just sits there, unremarked-upon, a wonderful incongruity that must be around half-a-century old. 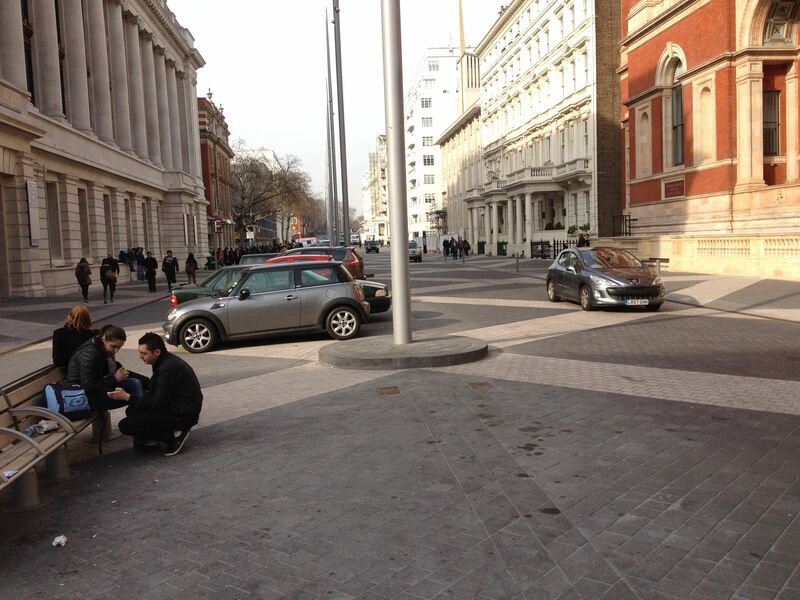 By contrast, just a few pedal-strokes away, Exhibition Road has begun making quite an exhibition of itself. Look! No curbs! No tarmac! And no-one travelling at more than 20mph! Personally, I like the grand social statement it’s making: humans, regardless of whether they walk, cycle or use a motor vehicle, can all share the same space safely. And the chap on the left is so comfortable with these new surroundings he has squatted down to fondle his companion’s leg. An extraordinary scene, I’m sure you’ll agree. The road planners of Kensington and Chelsea have also pedestrianised the junction of Old Brompton Road and Pelham Street, which is right outside the entrance to South Kensington station. 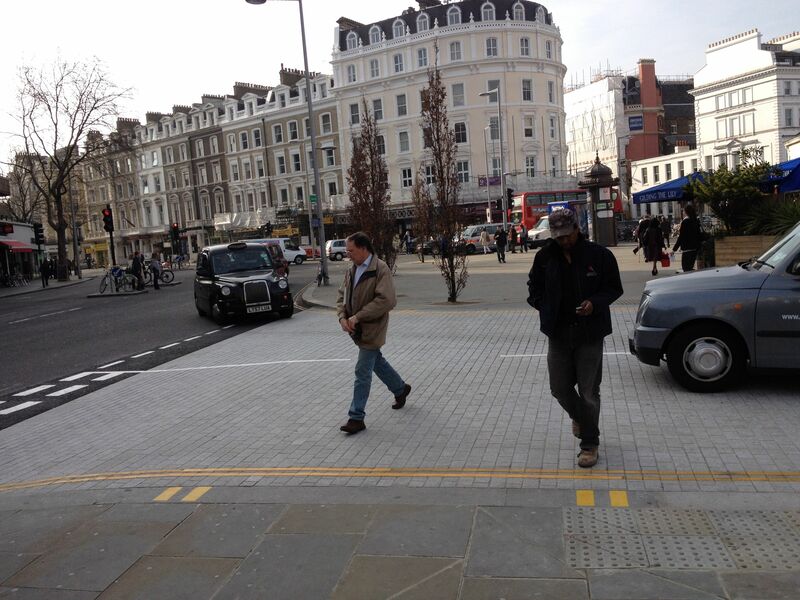 What you can see in that photo is a cab driver taking care not to hit two pedestrians. What you can’t see, because it happened about a minute before I took the picture, is me turning left into the junction with a big grin on my face because I no longer have to shout “WAKE UP” at someone walking blithely into my path without looking right. I’m not a psychologist, so I don’t know why removing a curb makes people more aware that they are stepping into traffic, but in my experience, it works. So there you have it: one inconspicuous old novelty, and two conspicuous new ones. And I take hope from what the former could say about the latter: if you fulfill a purpose quietly, invisibly, then you’ll be around in 50 years, too. Over the years, I have owned and used many items emblazoned with the familiar silhouette of a bitten apple. But my two favourites are probably the least technologically advanced, which is probably why their praises aren’t sung too often. So I would like to offer my own faint warble to them here. 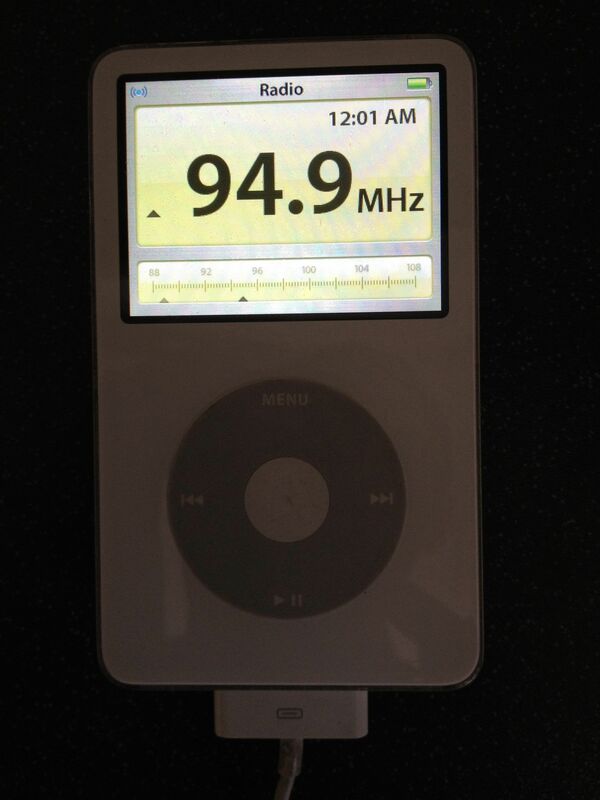 It looks like a Nano that’s grown a tail, but it’s actually an FM radio. Plug it into the old version of the iPod and the screen becomes a transistor receiver dial. Now, doesn’t that look nice? I’ve written before about my unbounded love for Danny Baker’s show on BBC London 94.9, but without this beauty, I wouldn’t be able to indulge in the simple pleasure of listening to the great man every day while I cycle into town. Having used the TuneIn app, I’ve learnt that radio via 3G is simply a means of disturbing your listening pleasure with random silences, and I’ve heard that DAB radios have the same problem. So for the foreseeable future, I’ll stick with this fantastic analogue oddity. My second thing of wonder is the remote control for the iMac. 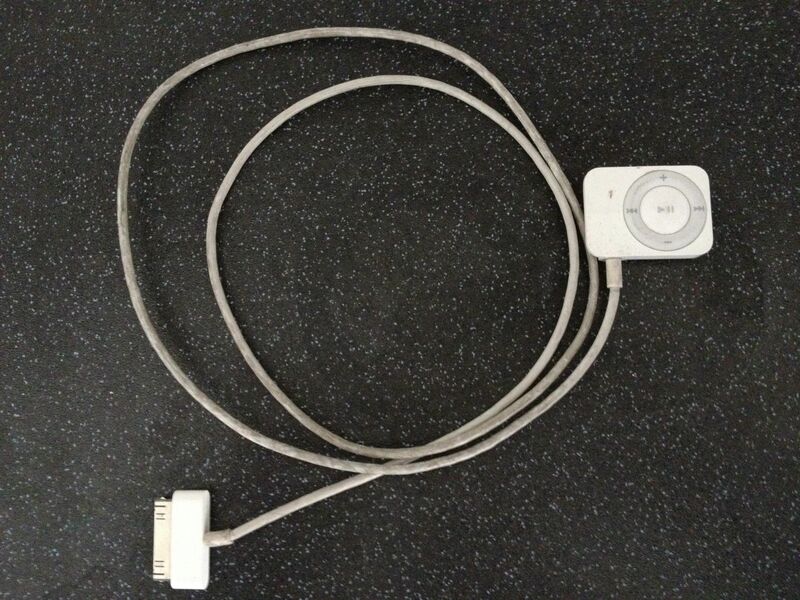 It enables you to adjust the volume, pause or skip tracks, and switch playlists or albums. All of which you can do with a mouse or a keyboard, but not when you’re slogging away on the turbo and you suddenly realise that you need to go one louder or change to a completely different playlist if you’re going to last until the end of the session. 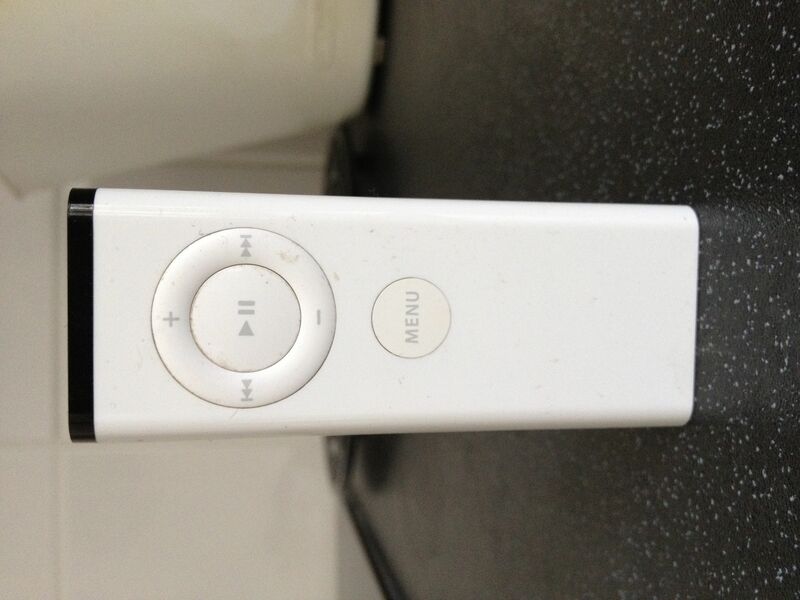 Essentially, by combining this simple infrared device with a pair of good speakers, you’ve turned your Mac into a less fiddly, turbo-friendly iPod.